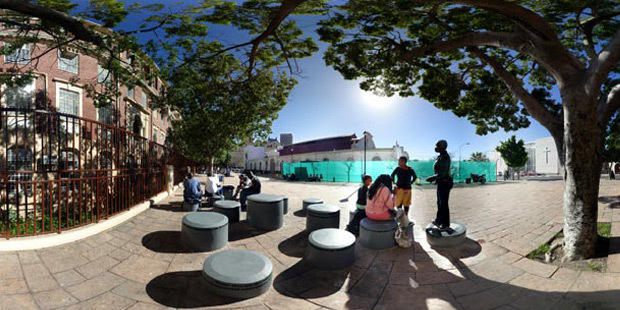 Art and design students from the nearby College of Cape Town relax on Ruth Sacks’s Longmarket Street memorial in honour of Cissie Gool. The 17 bollards of different sizes symbolise laws that were passed as a result of Gool’s actions. To mark its 100th year of publication in 2006, the Sunday Times embarked on a project to erect a trail of memorials across South Africa to commemorate some of the remarkable people and events that made history from 1906 - 2006. As part of the project, this online museum was created to showcase these memorials, bringing them together with a rich range of audio, video and archival resources from the last 100 years in South African history. How it all beganOn March 9, 2006, our first memorial - a playful statue of Brenda Fassie - was unveiled. Charlotte Bauer explains the thinking behind the project . Public art meets history’s heart Memorials can be many things, so why did we ask contemporary local artists to make ours? Lesley Perkes and Monna Mokoena explain. Heritage virgins come of age Sunday Times editor Mondli Makhanya discovers how much our memorials mean to the communities that helped us bring them to life. Who says history’s boring? Oliver Roberts reviews the original Sunday Times Heritage Project site and finds a multimedia must-have for anyone who didn’t pay attention in history class. In September 1997, the notorious John Vorster Square was renamed and transformed into Johannesburg Central Police Station. The bronze bust of Vorster was removed to the police museum.